On the 104th Anniversary of IWD – For Feminism and Socialism! A Socialist International women’s conference in Copenhagen in 1910 launched International Women’s Day globally in 1911. Trotskyist parties, including the predecessor organization of Socialist Action / Ligue pour l’Action socialiste in the Canadian state, re-launched the modern IWD in 1978. For good reason. Women’s oppression is rooted in the capitalist system. As with heterosexism, racism, environmental destruction and war, capitalism profits from discrimination, dispossession and plunder. Yes, we march for bread, and for roses too. We do so in the face of escalating attacks on basic human needs – a vicious austerity drive linked to the recent global recession. On average, women are paid 20-23 per cent less than men. Most women still bear the double burden of the preponderance of domestic labour, in addition to work outside the home. 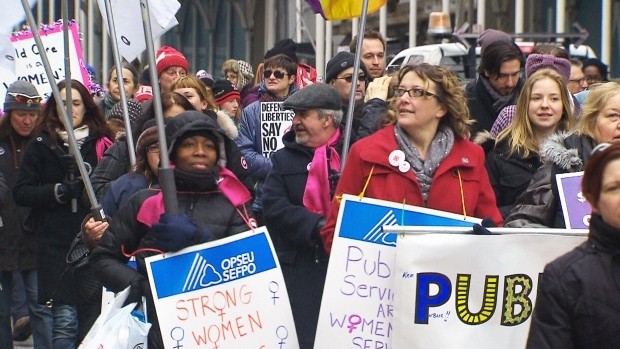 Members of the Ontario Public Service Employees Union march in International Women’s Day parade in Toronto, 2015. While trillions of dollars are wasted globally on corporate bail-outs and militarism, women and girls are denied adequate education, economic opportunities, clean water, health care, reproductive choice and personal security. From Palestine to Haiti, from Libya, Iraq and Afghanistan to Colombia, women and children are disproportionately the casualties of wars and military occupation in which Ottawa is directly involved or complicit. No money for war. Imperialist hands off Ukraine and Syria. End all subsidies to Capital. Tax big business and the rich. Fund health care, education and social services. Establish a cross-country universal, free, quality child care system. Enforce equal pay and equal access to employment. Restore funding to women’s social justice organizations, emergency shelters and legal aid. Build quality social housing. Raise E.I. rates and provide real access for part-time workers. For a $17/hour minimum wage. End precarious employment. For job security, a decent annual income and full benefits for all. Victory to the education workers, members of CUPE Locals 3903 and 3902, on strike at York University and U of Toronto. Phase out the Alberta Tar Sands development. Conscript corporate profits to convert industry, business, homes and schools to green energy. Socialist Action had a strong and highly visible presence at Toronto’s annual International Women’s Day events on Saturday, March 7, 2015. The theme called for an end to violence against women and children, and drew special attention to the many disappeared and murdered indigenous women. IWD began with a boisterous, packed rally at OISE U of Toronto auditorium, featuring solidarity with striking university workers from York U and U of T.
According to organizers, and as reported in the Toronto Star, over 5,000 participated in the march east along Bloor St. and south to Ryerson University. Women and their male supporters crowed into the annual Women’s Day Fair at Ryerson. Socialist Action hosted a large display of books, booklets, political buttons, newspapers, magazines and leaflets, both at Ryerson in the afternoon, and at OISE in the morning. A team of SA members distributed hundreds of leaflets, including the SA political statement for IWD, plus publicity posters for Rebel Films, the 29th annual Toronto SA May Day celebration, and the Socialism 2015 international educational conference, May 22-23.